Mark & Kathy discovered our work at the Madison Art Fair on the Square. They had long discussed updating their wedding rings for their 25th Anniversary, but Kathy had not found anyone's work that spoke to her, and they had let the project move to the back burner. Upon walking into our booth, she knew that had changed. Kathy instantly fell in love with our tension-settings. She desired a clean, modern design to show off her marquise diamond. Mark wasn't as clear on what he wanted in a design. He thought it might be time to update his band to a wider version, and thoughtfully took his time to arrive at a decision on texture for his ring. 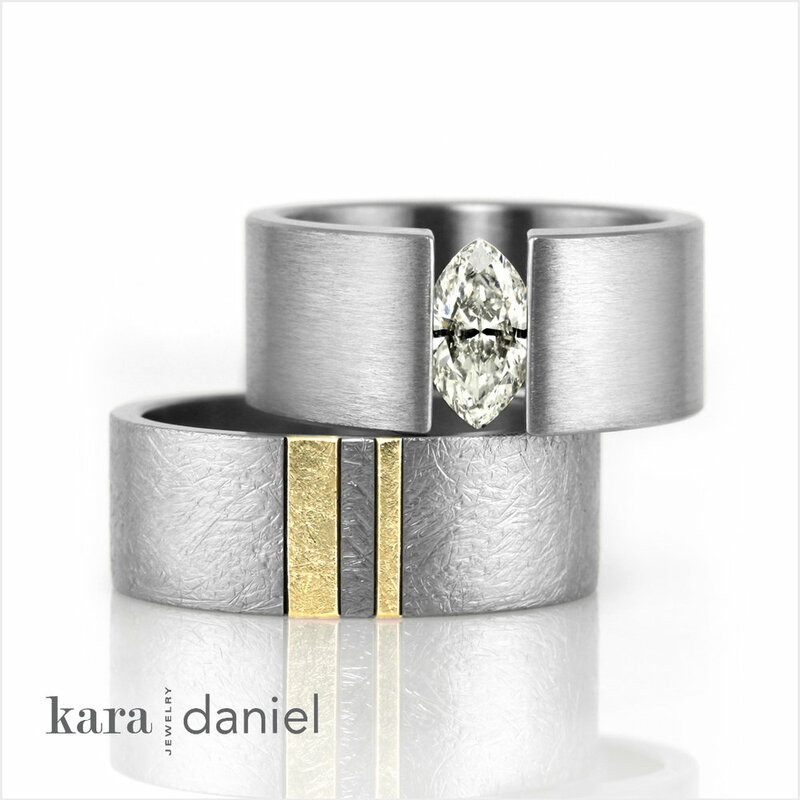 It felt important to both Mark & Kathy that gold from their original wedding rings come forward into their new designs, although both preferred the gold as an accent, rather than as the primary metal. The final result. We set Kathy's marquise in 'the one' tension-setting to make the most of it's unique shape. 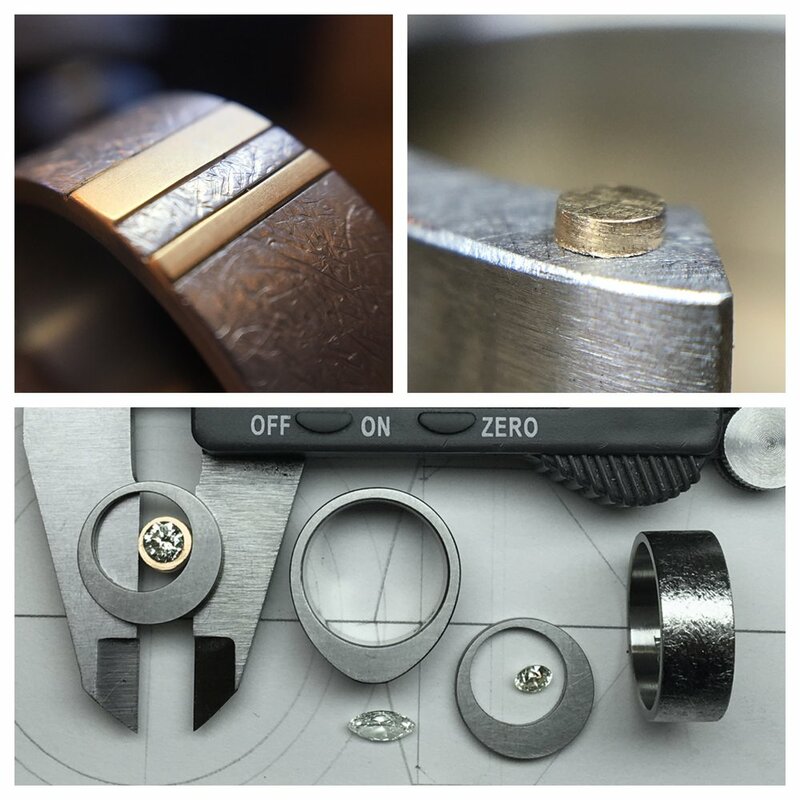 Mark landed on a rustic finish band, with recycled gold from his first ring as asymmetrical inlay. This sweet set of anniversary rings celebrate's their first 25 years and will be enjoyed for the next 25. Congratulations Mark & Kathy!